Thank you for taking a few minutes to read the Hastings-on-Hudson PTSA Newsletter! ﻿It will tell you about the PTSA’s upcoming events, fundraisers/grants, and initiatives. ﻿To learn more about what we do, visit our website at PTSAHastings.org . High School students are invited to dinner and a showing of The Princess Bride at HHS. Doors open at 6:30pm for dinner & movie starts at 7:15pm. Admission is $2, the entirety of which will be donated to Family-to-Family (benefitting a local Holocaust survivor, veteran, and refugee). It's Donation Time for the PTSA Used Book Fair! Bring your children to help price and sort books for the fair. Link below in fundraisers. 20th Annual Used Book Fair! 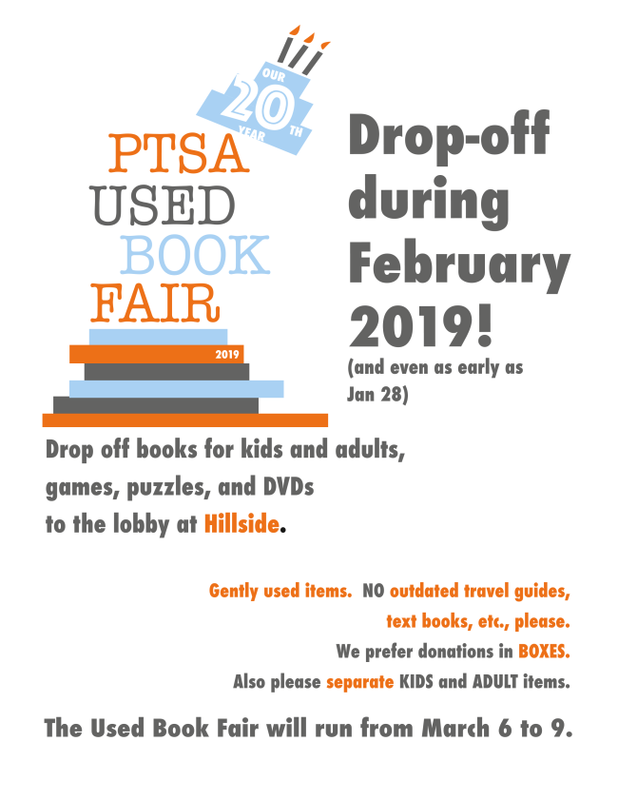 Anytime during the month of February, drop off your gently used children and adult books, games, and puzzles at the Hillside lobby. Donations in boxes rather than bags are best. Also, please separate children’s items from adults. 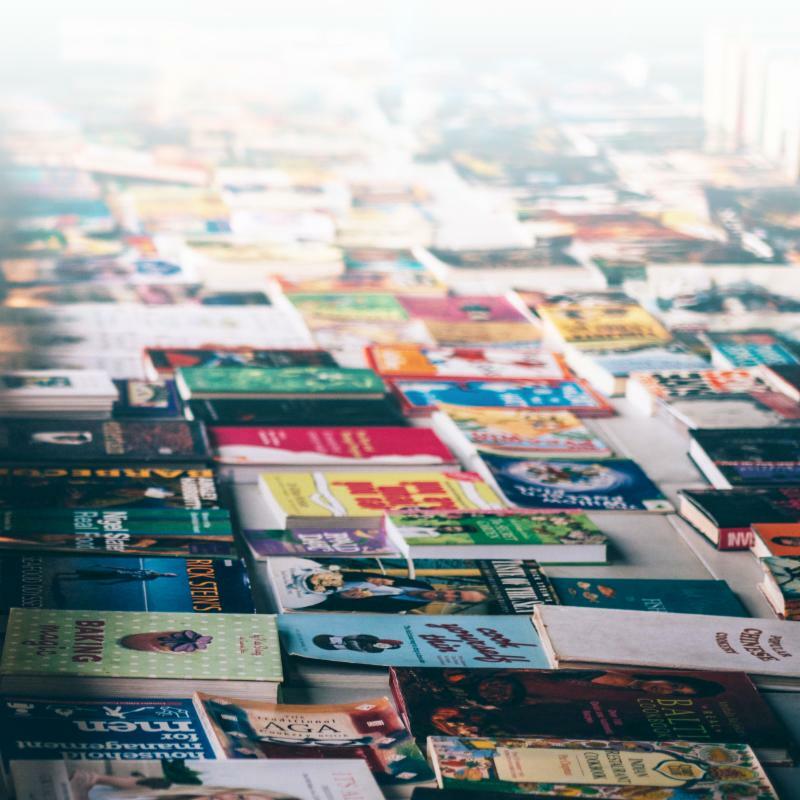 JOIN US to sort books (for any amount of time) on Saturday, 3/2, 10am - 4pm, at Hillside. Use this link to see all volunteer times and opportunities. This is a fantastic event and so much fun. ﻿Opening night is 3/6 from 6pm–8pm. Hillside classes will visit by grade on 3/7 and 3/8. All profits from Spirit Wear sales support our schools! You can purchase the new, popular line at Hillside’s Family Dance Night (2/8), the Used Book Fair at Hillside (3/6-3/9), and mini-Used Book Fair at FMS (3/11-3/12). Author Visit: Dan Yaccarino will speak to K - 4 students in three separate presentations. Mr. Yaccarino is an internationally acclaimed author/illustrator with more than thirty children’s books to his credit, including Five Little Pumpkins, Trashy Town, Unlovable, and The Fantastic Undersea Life of Jacques Cousteau. He also created and produced Nickelodeon’s Backyardigans. Culture Shock: Culture Shock is a HHS club that was started by students and raises money to give to local and global charities. PTSA funds will help them put on their annual Culture Show and food experience that aims to highlight the diversity and hidden talents of HHS students. Center Lane Presentation - The Changing Landscapes: Best Practices in Affirming LGBTQ+ People: The presentation was well attended! Center Lane clearly and insightfully defined terms, helped audience members see their own biases, explained how to better support the LGBTQ+ community, and gave tools and resources to guide future learning. Be Yourself Club – The PTSA provided materials for the student-created Be Yourself Club, a Hillside after school club that welcomes K-4 students for fun activities designed to make a difference in the world. See a complete list of grants for the past several years on our website. 1. Support the efforts of the schools to enrich the curriculum and school life. The PTSA is supporting an initiative identified by each school principal this year. 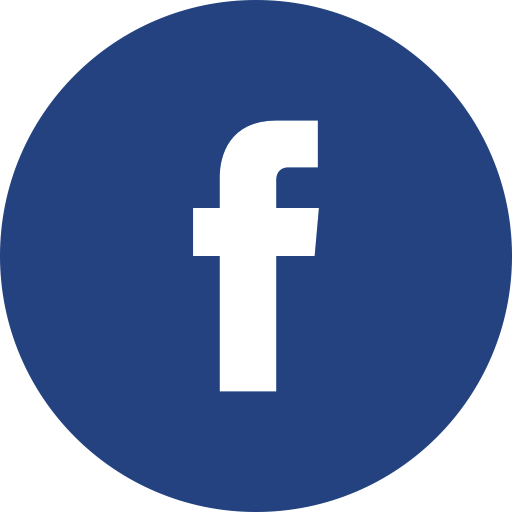 The PTSA will meet with 8th graders on the Student Leadership Board to learn more about ways the PTSA can support middle schoolers. Later in the year, we will meet with student volunteers from HHS for the same purpose.